Atulya business WordPress theme is designed to be highly responsive in all screen sizes varying from small screened smartphones to tablets, and even large screened computers. The theme is automatically made to fit the screen, and the contents will remain readable and intact. Atulya-multi purpose WordPress theme works great with all the modern and commonly used browsers like Mozilla Firefox, Chrome, Safari, Opera and so on. Atulya WordPress business theme comes with 3 layouts depending on the position of the menu. You can have the website menu on the left, on top or on the right hand side. These layouts allow you to build a large variety of websites with our theme. And in addition these layouts can be changed with just the click of a button. The installation of this multipurpose WordPress theme is pretty easy and can be done with just a few clicks. For better understanding, we have documented the steps in detail with demo contents. With more than 50 amazing animation effects using animate.css, you can easily customize the theme and make it more live. All these effects can be brought to any column of the theme. Atulya, the multi purpose WordPress business theme has a “Theme Options” panel at the backend, from where you can control most aspects of the website. The panel is built strong with the help of “Redux” framework, which is not only safe and secure, but also provides swift access for the admin to access different parameters like fonts, layouts, color schemes and more. All the options to customize the frontend is just clicks away, and can be mastered by anyone. 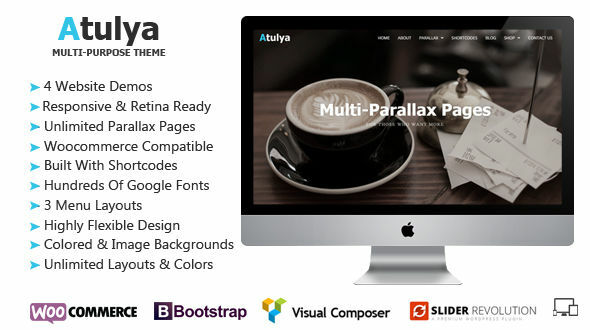 Atulya multipurpose WordPress theme is retina ready. You will not find any broken lines, or blurs, or scattered colors anywhere in the theme. This high-resolution effect is given to the site by the use of font awesome icons and google fonts. Thus the whole theme looks stunning in all screen resolutions. Atulya multipurpose WordPress theme allows you to use unlimited color schemes for your theme. This helps you to easily customize the theme to suit the color scheme of your logo or brochure. Atulya has introduced the unique concept of multiple parallax pages, and has thus brought a visual experience to the theme that none of the others have. You can have this feature in any of the pages like home page, about page, product page, service page, and so on. This makes it possible to create more than one landing page for your products. WooCommerce is a plugin developed exclusively for WordPress to integrate an online shopping platform. This plugin comes integrated with the theme, and makes it possible for you to start an online shop for your products.WooCommerce supports all the major payment gateways, and so you can easily monetize from online sales. The menu has advanced options to customize in the backend. You can change the menu font, font color, size, style, menu background color and so on. There are options to make the menu transparent as well, a feature which makes it possible to show a full page slider. Atulya WordPress business theme is compatible with the drag & drop plugin ‘Visual composer’. Atulya WordPress business theme is built with short codes, and thus provides more options for customizations. The main intention of using short codes is to simplify heavily complicated codes to simpler codes. Thus short codes play a key role in bringing attractive customizations with very little effort. Atulya multipurpose WordPress theme comes bundled with Revolution Slider worth $18.